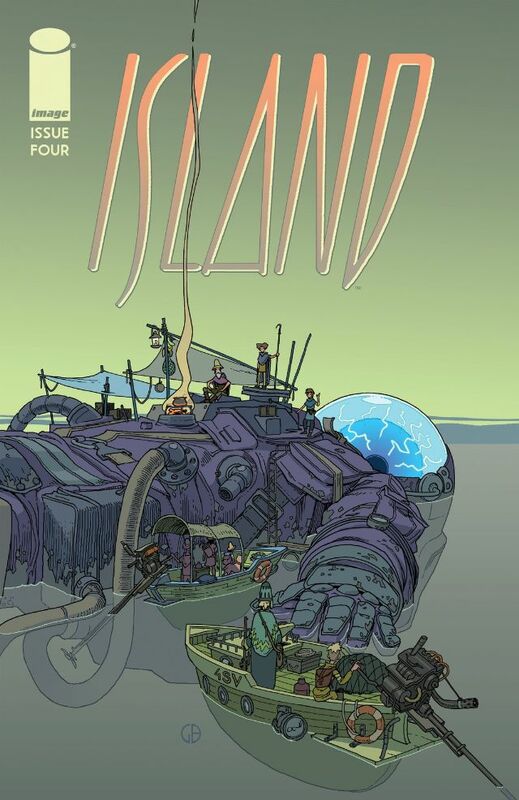 It took me a few moments to actually realise that each cover of this comic was focused around an island, of one kind of another. This page is probably one of the most exciting because it features a fallen spaceman as the base of a sanctuary of sorts. The local population made up of fishing folk type people, with their rudimentary lamps, clothing and boats have travelled to the foreign object to set up camp. The older gentleman sitting on the travellers chest has a cooking pot on a stove watching sea farers arrive. They are almost oblivious to the helmet, which sees sparks from a glowing blue focus. The sheer contrast in size and technology is not apparent to the indigenous people, and their naiveté prevents the anxiety of a power far greater than their own. I particularly like the detail shown on the travellers purple outfit, especially the gloves and the support tubing traversing under the water. It is a very interesting page and reminiscent of Gulliver’s travels, but the lack of movement from the spaceman indicates they have either died or remain dormant. But that is of no concern to the tiny settlers because they do not know any better and entertain no inquiry into a life from outer space. Next PostThe Theatre List 28/10 – A helluva week!